A bright beautiful smile can do wonders for a person beyond improving what they see in the mirror. 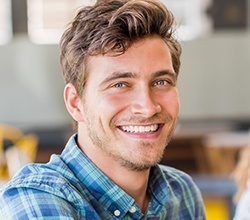 According to decades worth of research, having a wonderful smile is an easy way to make your peers think of you as attractive and successful. Does your smile say this about you? If stains, chips, cracks or gaps are holding you back, Dr. Bruno can use our cosmetic services to change everything. 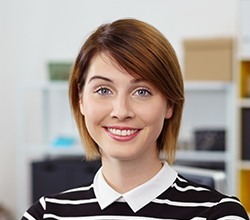 Whether you simply want whiter teeth or a complete makeover, she’ll help you achieve the gorgeous smile you truly deserve that not only looks great but is set up to function well over the long term. To get started, simply contact us today. Veneers are made of composite or porcelain materials that bond to the front of a tooth. They are primarily used to improve the cosmetic appearance of a tooth that has a defect such as a chip, improper alignment or discoloration. Cosmetic dentistry is an art and science. We carefully and precisely measure your face, head, teeth and gums to create teeth that are measured to fit your smile in an age appropriate way. We use the latest techniques and custom laboratories to create a flawless and gorgeous smile. Lumineers are very similar to porcelain veneers in that they are extremely thin restorations that are bonded directly onto the teeth. There is one main difference: your teeth don’t have to be reshaped much to fit them. Dr. Bruno is trained to evaluate your teeth and hear your desires for the cosmetic change you want and then let you know what the best way to achieve those goals are. Not every tooth on every patient is the right fit for something like a Lumineer, but Dr. Bruno does keep them in her bag of tricks for the right situation. In the 21st century of dentistry, we no longer need to rely on unsightly metals to help restore teeth. We have white composite filling material that Dr. Bruno sculpts to hold the same shape as your remaining tooth. The final result is strong and beautiful! In addition, we have a variety of composites or porcelains to make veneers, crowns, inlays or onlays. 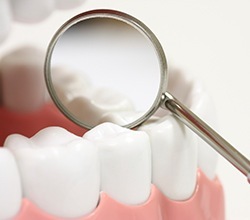 Is your teeth badly broken down from an injury? Was it stained from antibiotics as a kid? Do you jsut not like the look of your teeth because of their shape or size? Dr. Bruno can design beautiful restorations that are shiny and white so that only you and her will know that anything was ever done. Bonding is the application of an attractive composite resin that is prepared on the tooth and hardened in place. This helps make the tooth more appealing. Bonding can be used to repair dental decay, damage, gaps, misaligned teeth, and misshapen teeth for cosmetic purposes. We match the bonding to the color of your teeth so you get a natural look. A routine dental examination along with necessary X-rays is the first step to transforming your smile. Whether you’re concerned with dental decay or cosmetic treatment, our team is focused on providing you an exquisite experience that addresses all your desires. We look forward to helping you enjoy coming to the dentist! Before attempting to whiten teeth, an evaluation will be done to determine if teeth whitening is the right choice for you. Developing a good home routine and regular dentist appointments will keep a smile healthy, while a failure to care for your teeth properly can lead to discoloration from pigments found in food and drinks and the use of tobacco. However, not all causes of discoloration are from improper oral care. Dentin tissue is found under the outer enamel of a tooth, and factors such as age and injury can cause it to become more visible. 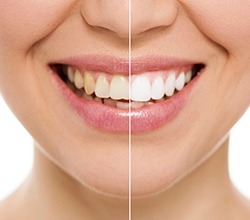 We offer two methods of professional whitening. 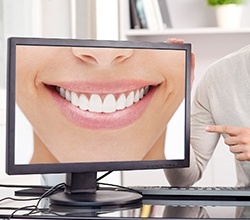 We will help you find the right solution to a brighter smile! By taking a nice series of photographs of your teeth in your comprehensive exam, we are then able to use our in-house program to manipulate the size and shape of the teeth on the photo so that you will be able to see what a cosmetic change can do for you and your smile! This will help you get a better idea of what to expect and will also allow you and Dr. Bruno to look at your smile together and decide what is important to you. We look forward to helping design a smile that keeps you happy and healthy for a lifetime.